Mareeba, a rural town, is 40 km west of central Cairns. It is reached circuitously by railway or the Kennedy Highway, both via Kuranda. Situated on the northern end of the Atherton Tableland, Mareeba is at the junction of Granite Creek and the Barron River, and it is thought that the name was derived from an Aboriginal word referring to a meeting of the waters. When first settled, Mareeba was known as Granite Creek. When the Wild River (Herberton) tin mining field was opened in 1880 the local landholder, William Atherton, opened a wayside inn and store where the coach road from Port Douglas crossed the half way mark at Granite Creek. 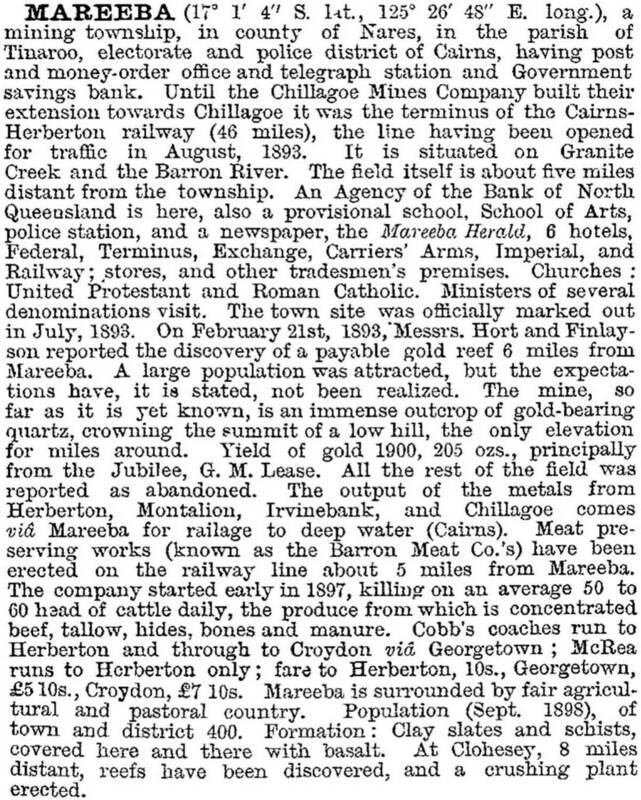 Gold was also found in the nearby Tinaroo Creek and Davies Creek (1880, 1883) and Mareeba enjoyed a brief period as a gold rush town. The Cairns-Kuranda railway line was extended to Granite Creek in 1893 and the change of name coincided with the opening of the new railway station and the erection of a large Jack and Newell general store. Within less than 30 years Mareeba was an important railhead: branch lines were opened to the Atherton Tableland (1903-21); and to Herberton and Ravenshoe (1910-16), west to Chillagoe and Mungana (1901) and south-west to Einasleigh (1909), all mining towns. The Mareeba to Chillagoe line was also fed by branches from the Mount Garnet mine (1902) and the Mount Mulligan mine (1913). The lines transported ore, smelted metal and livestock. It had taken seven years for the Cairns railway to surmount the Range and reach Mareeba. Herberton had been the railway's ultimate destination, but the various other mining lines - several privately financed - had intervened. When the line reached Mareeba, the town was surveyed, the place renamed, and a school opened (1893). The Mareeba Express began publication c1895 and there were six hotels and several stores recorded in the Australian handbook (1896), which estimated the population at about 225. A sawmill began in 1903. As well as the primary school there was also the Barron high school (1903); a convent school was opened in 1909. By 1919 Mareeba was the district's most important town. Several local shires were amalgamated, and the new unit (Woothakata Shire) discarded the former shire offices in Thornborough and opened offices in Mareeba. The various surrounding mining centres created a market for locally grown livestock, fruit and vegetables. In the 1920s some farmers added tobacco to their range of crops. In the 1930s, increased federal tariffs on imported tobacco and the Queensland Government's closer-settlement plans for Mareeba brought about the Mareeba tobacco growers' cooperative and a campaign for irrigation. Not only tobacco was involved, as armed services personnel in World War II created a demand for locally grown vegetables. An irrigation weir had been constructed in 1937, and the influx of foreign-born farmers was evident from the new Catholic church (a Mareeba tourist sight) also opened in 1937. After the war local tobacco interests resumed lobbying for irrigation, and the large Tinaroo Dam (1958) was completed, supplying farms and towns as far afield as Mareeba, Kuranda and Yungaburra. The decline of mining and closure of railway branch lines was not reflected in Mareeba's steady postwar population increases. In 2001 employment in mining in Mareeba Shire was a mere 1% of total employment, and employment in agriculture was 18.5%, the highest of all the employment sectors. Tobacco, however, was becoming an increasingly minor crop, and in February 2005 Mareeba presented an exhibition of the industry's past at its heritage centre. Accommodation and hospitality had 5.5% of total employment.